Fungi are all around us. Some of it we can see – mushrooms and molds, while others we cannot – Pestalotiopsis, the disease-causing fungi that our students in the B.A.M. and J.A.M.I.N. 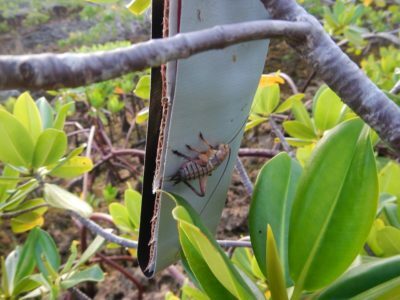 programs find present on mangrove tree leaves. How do these mangrove leaves become infected? It’s a warm day in The Bahamas and a gentle breeze causes the mangroves near the fringe of the water to gently sway back and forth in unison. Unseen to most, there is a sinister offender secretly working against the leaves of these salt-loving trees. 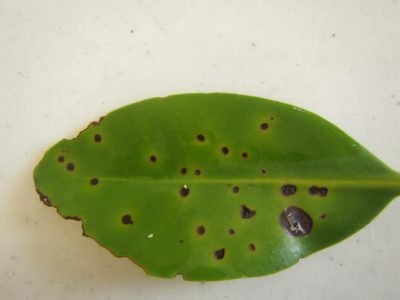 Microscopic black spores rest on the surface of the red mangrove leaf, but inside a white fluffy fungus, Pestalotiopsis, has invaded, infecting the leaf from the inside out. The spores are a sure sign that the fungus has recently reproduced. A gust of salty wind carries several spores into the air, never to be seen again. In the distance, a cricket hops from mangrove leaf to mangrove leaf looking for a meal. Soon, it makes its way to an attractive leaf, that happens to be infected. The insect moves methodically along the leaf, feeding as it goes. Unknowingly, the cricket walks through the fungus. Its legs become covered in tiny black spores. When the cricket has had its fill of green goodness, it moves on to the next tasty leaf. The cricket leaps through the air with the greatest of ease and lands on an adjacent mangrove leaf. 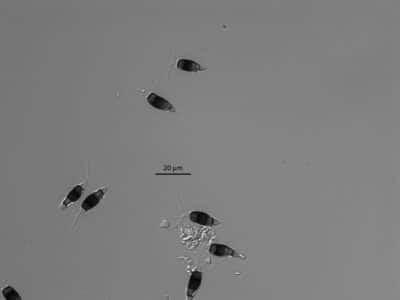 The impact of its landing causes a couple of the spores to fall loose onto the leaf. The cricket sees a bird circling in the air and scurries to find cover. Leaping from leaf to leaf, more spores are left behind. Now one of the spores is alone on a mangrove leaf. It has landed on the perfect dwelling – open tissue. Before the spore can begin weaving its intricate web of death, it secretes an adhesive to secure itself. The environmental conditions are favorable too, and rather than going into dormancy, the spore increases its metabolic rate. The spore germinates and begins to grow. Then, a hypha emerges from the spore. More energy is needed for additional hyphae to grow. These organisms can’t make their own food, like photosynthesizing plants, because they lack chlorophyll. Instead, they must absorb nutrients from other food sources to survive. Like the cricket, the fungus finds the nutrition it needs from the green mangrove leaves. It releases enzymes that break down the leaf’s tissues and absorbs the nutrients. 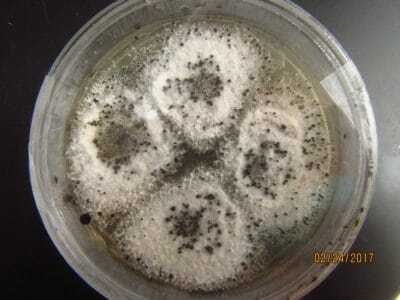 With more nutrients, the fungus can continue growing hyphae. The first hypha generates one hypha from its tip, but they remain attached to each other. Then, at each end, additional hyphae grow. The process continues over and over again, until eventually this web of long branching filaments, collectivity called the mycelium, expands across the entire inside of the mangrove leaf and consumes it piece by piece from the inside out. Some fungi consume non-living organic matter. Others are able to have a symbiotic relationship with organisms without harming them, but not Pestalotiopsis. This parasitic fungi feeds on its living host, the mangrove tree, causing disease. As Pestalotiopsis spreads, it kills the leaves of the mangrove tree. When there are no longer leaves on the mangrove tree, it is unable to make food via photosynthesis, and the tree dies. Before the fungus runs out of food, it reproduces and generates new spores. Then, the cycle begins again. 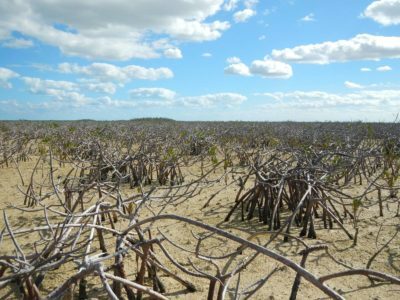 North Carolina State University doctoral student, Ryann Rossi, studies mangrove disease throughout The Bahamas. 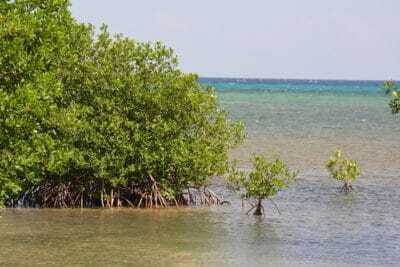 She has found a fungal pathogen called “Pestalotiopsis” to be the main cause of mangrove die-offs on several Bahamian islands. Crickets have intensified the spread of this disease. They not only spread disease by transporting spores to other mangrove trees, but when they feed on the mangrove leaves, they create patches of open tissue. The open tissue makes the leaves susceptible to disease. If a spore infiltrates the inner leaf tissue, then it can germinate and infect it. In collaboration with Ryann Rossi and our local partners in Jamaica (University of the West Indies Discovery Bay Marine Lab) and The Bahamas (FRIENDS of the Environment), students in our B.A.M. and J.A.M.I.N. programs participate in a citizen science project. They collect potentially diseased red mangrove leaves and determine whether “Pestalotiopsis” is present in their samples. The samples are then sent to Ryann for further analysis. By participating in this citizen science project, students are contributing to actual science.